Craving a burger but don't want to completely derail your diet? Not to worry! Burgers can be physique-friendly with the right ingredients. Eating healthy doesn't have to mean shunning your favorite foods—like the classic American burger. The key to creating physique-friendly foods is finding suitable substitutions for your less-than-healthy favorites. In the case of burgers, this means replacing high-fat ground beef and empty-calorie buns with leaner alternatives and tasty additions. We're talking twice the flavor for a fraction of the fat! Regardless of what your physique and fitness goals happen to be, there is a burger here with your name on it! If you want an unbelievably delicious yet simple burger that takes no time at all, this recipe is for you. 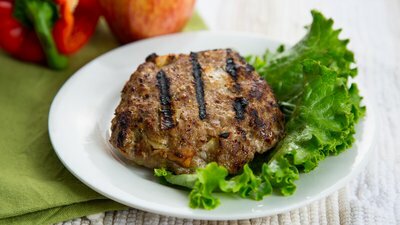 Low in fat and carbs and packed with protein, this simple ground turkey burger is perfect for even the strictest of diet plans. If your diet plan allows a higher carb intake but you don't want the gluten that comes with a normal burger bun, a black bean burger is a great alternative. This burger tastes great over a bowl of rice and diced vegetables and topped with salsa or melted cheese—or both! The black beans provide a nice blend of protein, complex carbohydrates, and dietary fiber, giving you plenty of nutrients and energy while keeping you lean and ready for your next adventure. Another great vegetarian option, this chickpea burger has it all. You'll get some complex carbohydrates from the chickpeas, coupled with protein and enough healthy fats from the added seeds to balance out your macros. These burgers can easily be eaten on their own for long-lasting energy or served with your favorite side dish for a complete meal. If you love the taste of Thai, this burger recipe will become a staple in your kitchen. Filled with lean ground chicken breast for protein and healthy fats from natural peanut butter, it's a great lower-carb option for those who still want to enjoy a juicy and flavorful burger. If it's a sweet burger you crave, this turkey burger recipe is sure to fit the bill. Apples bring in a refreshing change of pace, while giving you an added dose of fiber your body is sure to love. The ground turkey supplies the protein, while the avocado on top provides plenty of healthy fats. Serve this any day of the week for a quick and delicious meal that's ready in under 20 minutes.